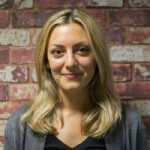 Customer demand for biometric security options is growing. Not only is the technology viewed as a more convenient way to log in to a bank account or to verify a transaction than a username and password, but it also minimises the risk of forgetting important login details. Some customers segments are now demanding the technology to the extent that they would consider changing banks if it wasn’t available at their current provider. Banks are responding, and this quarter we have seen a number of brands incorporate biometric security into their digital propositions. ‘The potential of biometric technology extends well beyond current basic financial functions such as logging into a secure banking site or viewing an account balance,’ says Rory Pennington, Senior Analyst at Mapa Research. Since Apple incorporated fingerprint-recognition technology into their mobile devices in 2013, it has become increasingly common for banks to make use of this technology to authenticate mobile banking users. In the last Mobile Banking Dashboard update, 48% of the 52 banks that Mapa monitors were offering TouchID as an option for customers to log in to their bank accounts via Apple devices. 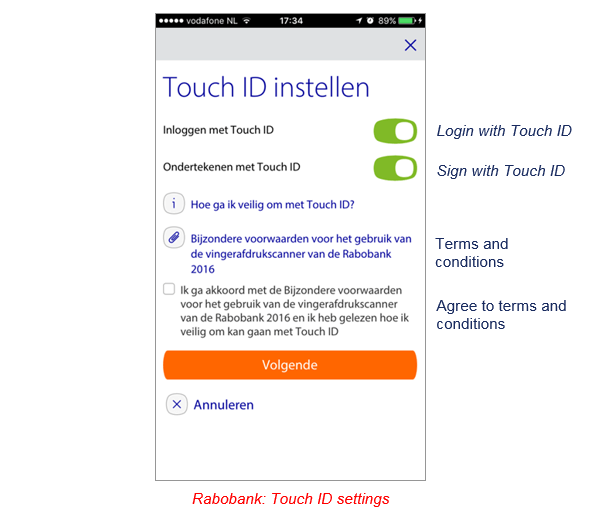 Lloyds Bank (UK) and Rabobank (NL) were among the latest banks to introduce fingerprint security into their digital banking propositions. This increased use of TouchID is not particularly surprising. According to research carried out by Visa Europe on 14,000 European customers, two thirds of those surveyed want to use biometrics when making payments and 53% preferred fingerprint scanning over any other form of biometrics. Among young banking customers, this demand is even stronger. Not only do they have a preference for fingerprint and facial recognition technology over pin codes and passwords, Visa also found that nearly a quarter of people aged 18-29 said they would consider changing bank if they weren’t offered biometric authentication to verify money transfers. In addition, Intelligent Environments have reported that 45% of UK consumers would like to use biometric tools to access their bank account. Yet, despite this demand for biometric technologies, only 13% of respondents are currently using fingerprint biometrics, while less than 4% report that they are using other forms of biometrics. ‘As the process to switch on and start using fingerprint recognition technology on mobile banking apps is a simple process in the UK, banks generally greet customers with an interstitial tour of the feature upon logging in once the service has been launched. The real adoption issue seems to be introducing fingerprint biometrics into other banking channels. The majority of laptops and desktop PCs do not have this technology installed,’ says Pennington. In the US, however, biometric usage seems more prevalent. Reportedly, 33% of Bank of America’s 20 million customers are using TouchID to log in to their accounts. On Tuesday, Gary McAlum, senior vice president and chief security officer for USAA, said that the bank has 1.3 million customers enrolled in and using biometric verification – 88% of these are using TouchID, 7% are using facial recognition, and a small percentage is using voice recognition. The launch of voice assistants has caused voice technology to quickly become one of the most exciting biometric features. One of the most common uses of voice technology in financial services is when customers call their bank’s service centre. 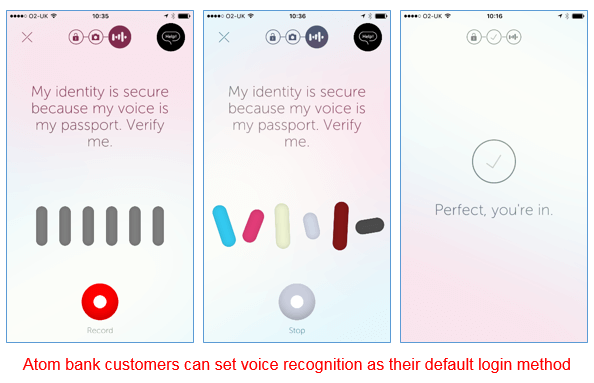 In 2015, Citi introduced voice recognition to try and tackle a major pain point in the customer experience: authentication over the telephone. At the end of 2015, roughly 250,000 of Citi’s U.S. credit card customers were opted into an agent based Voice Biometrics Authentication Initiative. In the UK, adoption of voice recognition technology is growing. Banks such as Barclays and HSBC are using this technology in their service centres, whilst Atom bank uses voice biometrics as an option for customers to log in to their app. It is argued that, in the not too far distant future, this technology will have a much greater impact on the development of smart devices. Last week, The Economist wrote how voice technology has the power to revolutionise computing – it enables “natural means of interaction” with different devices and could completely remove the need for user interfaces. Imagine not having a mobile banking app. Instead, you ask your voice assistant to transfer an amount to a friend or to tell you your bank balance. 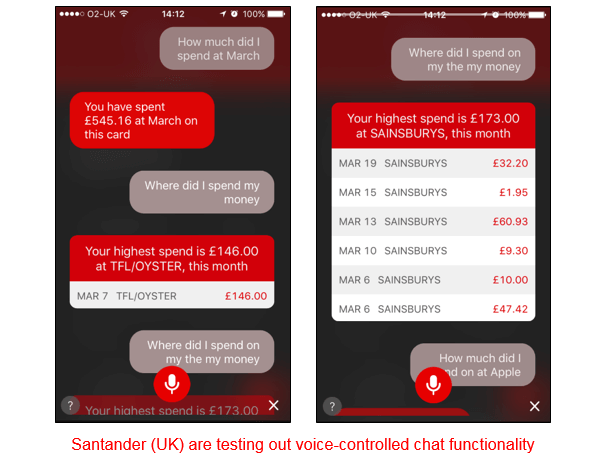 A few steps behind this scenario is Santander, who have started trialling a voice-based chat in their standalone app, SmartBank. As we discovered in our report on Artificial Intelligence in banking, technology still has some way to go before we would be able to rely on voice-controlled devices. Currently, machines have no understanding of language and context, they are mainly listening for, and responding to, commands. However, this raises a question of privacy. Voice-controlled devices work better the more knowledge they have about the user, this knowledge would be acquired through access to a wide range of personal and sensitive data sources like emails, calendar and so on. Another concern is that, even when they’re not used, voice assistants are always listening for their trigger command – ‘Siri’, ‘Alexa’, ‘OK, Google’. It might not be sending audio to the cloud until the voice technology has been activated with this command but, once the assistant starts transmitting the user’s voice to servers, it’s not very clear how and what is stored. 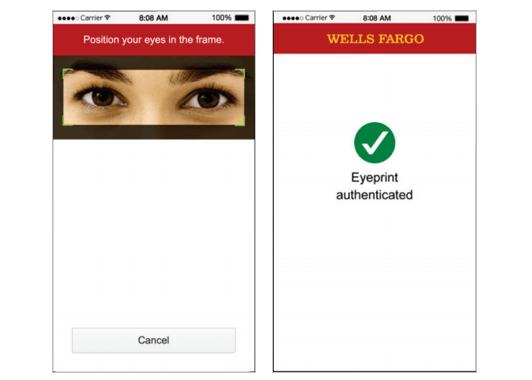 In 2016, Wells Fargo began offering revolutionary eye-recognition technology as a security measure for their corporate customers. Rather than reading the iris, this technology looks at the veins in the whites of the eye and compares it with a picture on the user’s phone. Because the photo is kept within the account holder’s phone, there is no need for the bank to store a database of eye recognition data making the system harder to hack. 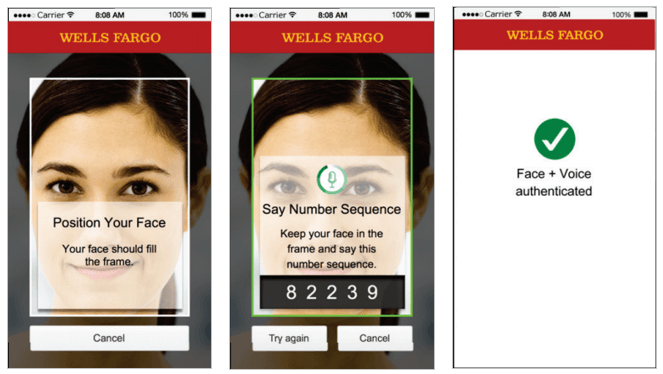 Wells Fargo customers also have an option to log in with ‘Face + Voice’. This feature is also only available to corporate customers. Leading in the way of biometric security is USAA, which has been offering customers the option to log in with a fingerprint since late 2014, and via face and voice recognition technology since the beginning of 2015. ‘Some challenger banks in Europe have already made steps in this direction and have started implementing video identification software into the new-to-bank onboarding process,’ Pennington says. He is referring to online bank Fidor partnering with IDnow, a provider of identification and electronic signature solutions, to provide customers with the ability to on-board customers remotely via video chat by just using their passport. New to bank customers are only required to apply online with the bank before installing an app and verifying themselves by showing them alongside their passport during the video call. Fujitsu has spearheaded a collaboration of biometric solutions to provide a mobile platform for financial institutions to collect, process and verify documents and the identity of new applicants in less than five minutes. From a single platform, the software requires the customer to simply take a picture of their identification as well as themselves and upload it into an application. Not only is the application prepopulated using the information captured from the image from the ID, but the images are analysed by a biometric engine and verified almost immediately. ‘With new biometric solutions not only available to institutions, but also being incorporated by new online challengers, banks have to start embracing the true potential of biometric technology. Whilst the ability to view balances and log in to mobile apps via a fingerprint scan is currently valued by customers, banks are missing out on the opportunity to streamline and simplify processes which traditionally cause the most frustration amongst banking customers,’ says Pennington. For more insights on how different financial services providers are approaching digital security, please contact us today.